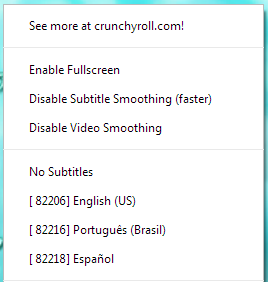 Crunchyroll - Forum - Ability to turn off subtitles? Hi, I'm learning Japanese and I got a a crunchyroll membership in part of that process due to the vast amount of titles you guys offer. I'm trying to watch Random Hero and I want NO SUBTITLES. English - my native language - subtitles make it so that I don't have to work in order to watch which forgoes the entire point of learning Japanese. Right now I'm watching with Portugese subs because I don't know that language, but it's still distracting. Help? If you right click on the video, you have an option to turn off the subtitles. Unfortunately, this has to be done on a per-video basis, but CR is aware of the desire to have no/Japanese subs as on option. Note that some shows have "hard coded" subs so they cannot be turned off. Example this season: Valvrave the Liberator. Reviving an old thread. Is there a way to turn off subs on the PS4? AFAIK, subs on all devices are hard coded (i.e., included in the video, not as a separate overlay that can be toggled). Devices = Everything that isn't using the web browser player. That is what it looked like. Thanks for the reply. Unfortunately there are a lot of liberties taken with the translation and a lot of them are not entirely accurate. Fun for reading and no so inaccurate that they misrepresent the situation, but off enough that it bothers me when I hear them say one thing and the subs have this slightly different thing... It is causing a fun internal debate rather than allowing me to enjoy the show. I think there should be something done about that- if possible. Shouldn't it be easy for crunchyroll to add that option? I'm also learning Japanese, and trying a membership now I thought I could turn off the option-- it makes me really reconsider paying for a membership at the moment. I hope there can be something that can be done! Yeah it is very frustrating when I want to watch an anime without subtitles. I know that some anime have it hard coded but I think on the Consoles, there should be an option to disable subtitles as well. The subtitles are hard coded into the video. In order to allow for disabling subtitles, the player would need to be completely re-worked, and the entire catalog may need to be re-encoded, depending on what file formats are required for the new app. It should also be noted that CR staff have stated in the past that they are en entertainment company, not an educational service. The subtitles are hard coded into the video. In order to allow for disabling subtitles, the player would need to be completely re-worked, and the entire catalog may need to be re-encoded, depending on what file formats are required for the new app. I understand that, but as a paying customer (and like most end users for almost any service), I simply don't care for technical excuses. If the player needs re-working, then they should re-work it. It's a video streaming app, not an open-world video game. It's not a complicated piece of software. If the entire catalogue needs re-encoding, re-encode it. So it takes a couple of high-end PCs a year (or more) to grind through it all - no big deal. Start somewhere and roll it out gradually. It wouldn't cost much at all. Way I see it, they just took a bunch of shortcuts at the expense of the end user to save time and money, while other paid video streaming services offer full subs switching on every device without an issue. It should also be noted that CR staff have stated in the past that they are en entertainment company, not an educational service. Even if this goes without saying - which it does - I think this is an incredibly obnoxious and dismissive thing to say to a customer that's requesting nothing more than what is generally considered to be a basic, standard feature of video streaming services. Either way, I've had an amazing time with my CR account in the past month since that comment, so I'll be keeping premium regardless. It's such a great service, and I'm happy to support their work. I understand that, but as a paying customer (and like most end users for almost any service), I simply don't care for technical excuses. If the player needs re-working, then they should re-work it. It's a video streaming app, not an open-world video game. It's not a complicated piece of software. If the entire catalogue needs re-encoding, re-encode it. So it takes a couple of high-end PCs a year (or more) to grind through it all - no big deal. Start somewhere and roll it out gradually. It wouldn't cost much at all. Regardless of what you believe it would cost, would the benefit to CR's bottom line exceed that cost? I doubt it.